The mission of Saddler's Woods Conservation Association is to preserve and protect the native biodiversity of Saddler's Woods through stewardship, restoration, education, research, and land acquisition. Saddler's Woods is a 25-acre urban forest unique for its diverse ecological features, including old growth forest, young woodlands, meadow, and wetlands. It is located in Haddon Township, NJ, within five miles of Philadelphia, PA. The woods surround the headwater spring of the main branch of the Newton Creek, a tributary of the Delaware River. Every year, thousands of visitors enjoy Saddler's Woods for passive recreation and nature interpretation. The old-growth portion of Saddler’s Woods is a time capsule, showing visitors the type of forest that once existed when the Arowmen and Erinwonek tribes of the Leni Lenape nation lived here. In the 1800s, former slave Joshua Saddler raised his family next to the woods and wrote into his will that none of his heirs "shall cut the timber thereon". For this early preservation ethic, the woods were officially named in his honor in January 2004. To learn more about the history of Saddler's Woods, visit our History page. 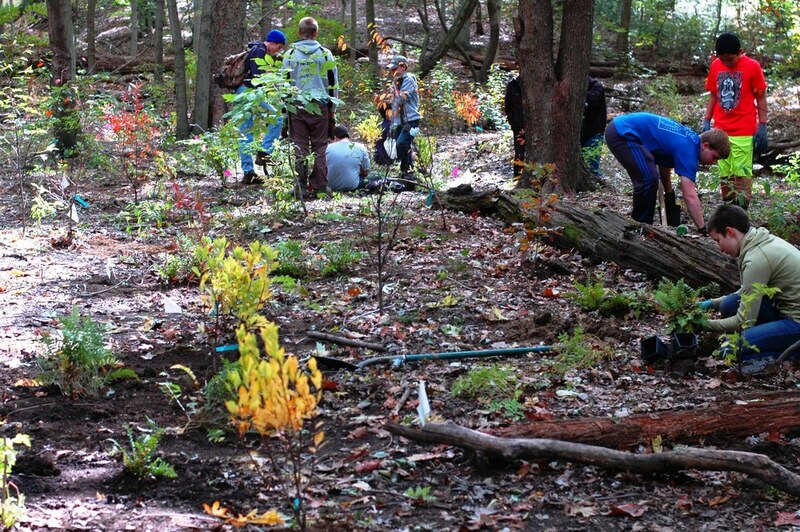 Saddler's Woods Conservation Association (SWCA) is a 501(c)(3) non-profit organization, formed by Haddon Township residents who were active in the movement to save the woods from a development threat. Unfortunately, Saddler's Woods had suffered decades of fragmentation and neglect. Since its preservation, SWCA volunteers have logged hundreds of hours restoring the woods and offering tours and educational programs. For these efforts, SWCA was honored by the Association of New Jersey Environmental Commissions (ANJEC) with an Environmental Achievement Award. The Partnership for the Delaware Estuary, Inc.